The skincare system that I’ve been using for the past month is the Caudalie Vinoperfect collection. I started to get acne scarring in the past year or so which took me by surprise. I only get one or two pimples a month but almost every time, I’m left with a dark mark! 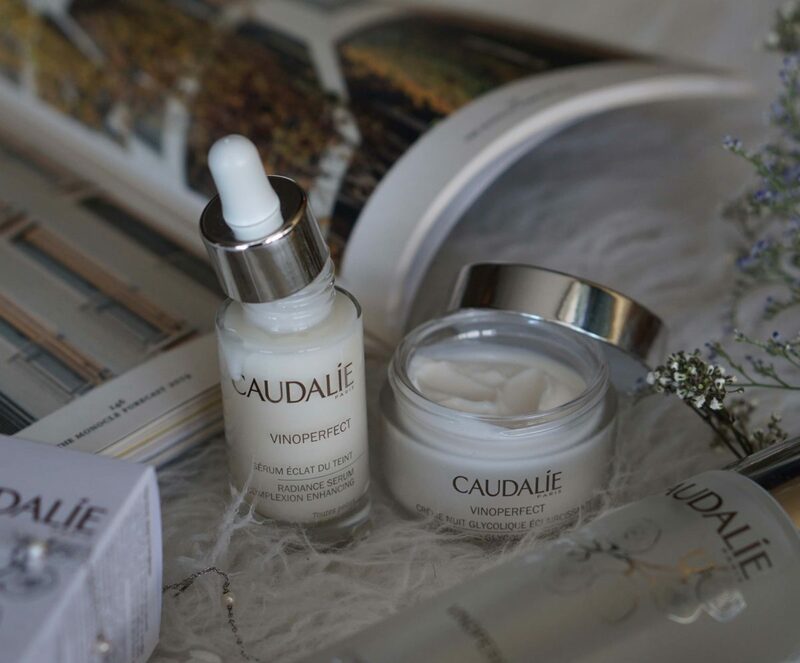 The new Caudalie Vinoperfect Glycolic Night Cream is suppose to help with evening out the skin tone so I was very excited to try the whole collection. 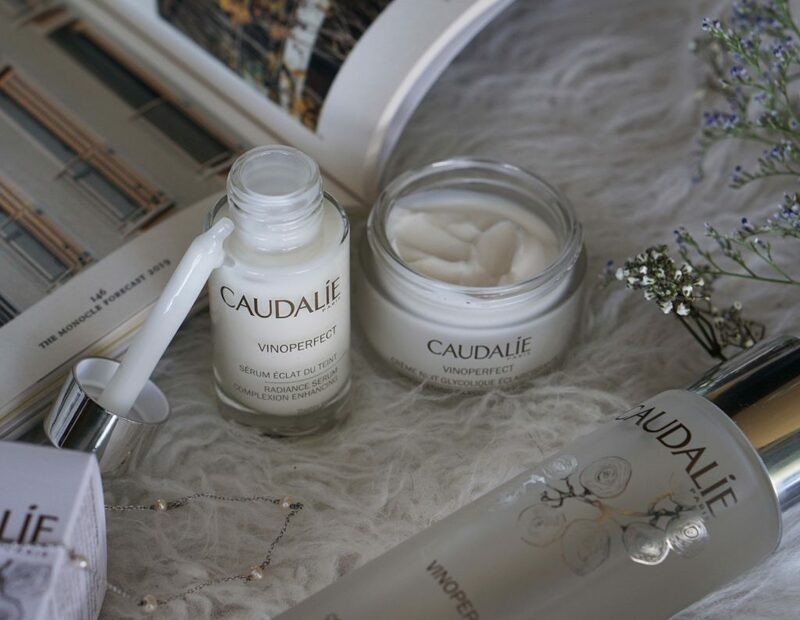 The Caudalie Vinoperfect collection is the brand’s solution to brighten and even the skin tone. 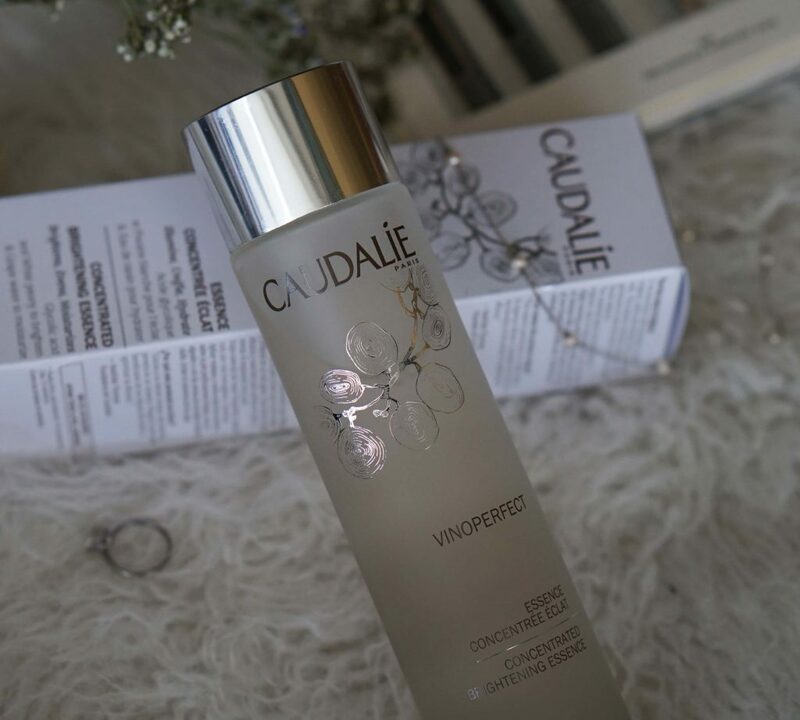 To reduce the appearance of dark spots, the key ingredient is Viniferine. This ingredient is apparently 62 times more effective than Vitamin C! There are three products in the range and I’ve been using all 3 together to see the full effect. 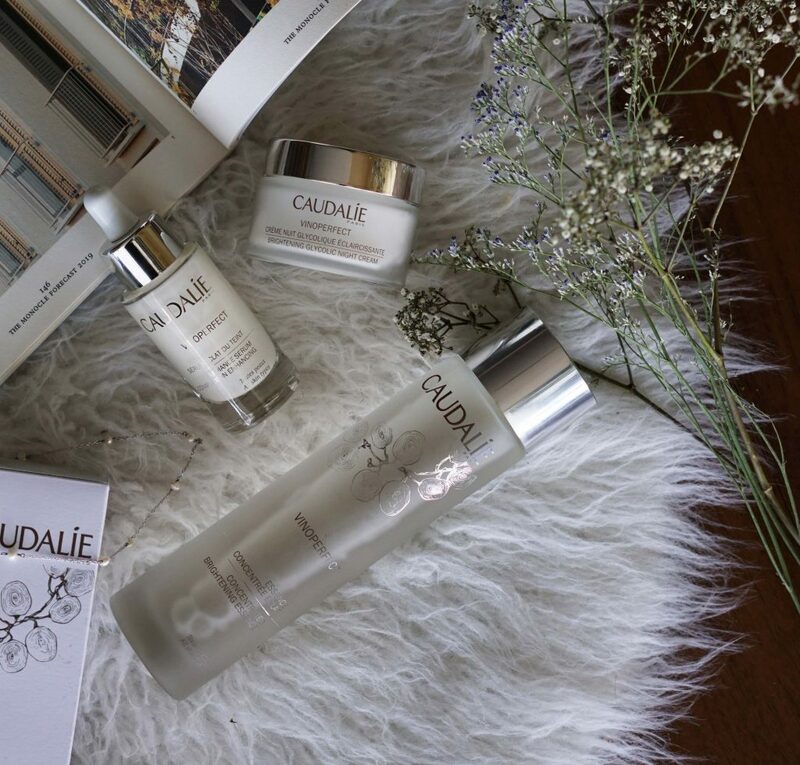 You can find these products at Sephora, Caudalie online and also at the Shangri-la spas in Toronto and Vancouver. 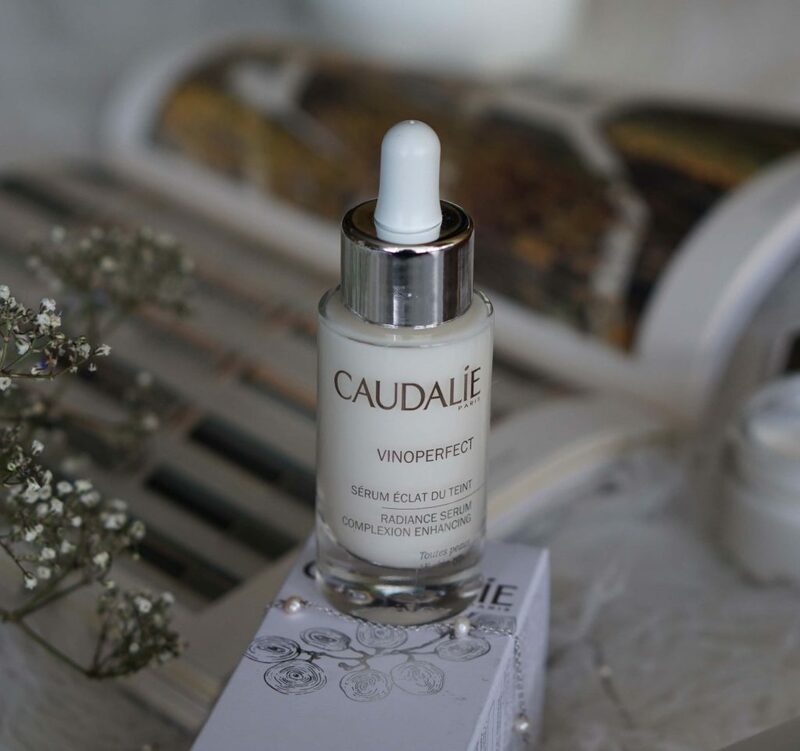 like to use the Caudalie Vinoperfect Brightening Serum ($56) to quickly hydrate my face, remove any last traces of the cleanser, and to level out the pH. There is a light sweet scent to this essence which only mildly reminds me of grapes. The texture is just like water but it does leave the skin momentarily tacky until it dries. It is a good basic toner. 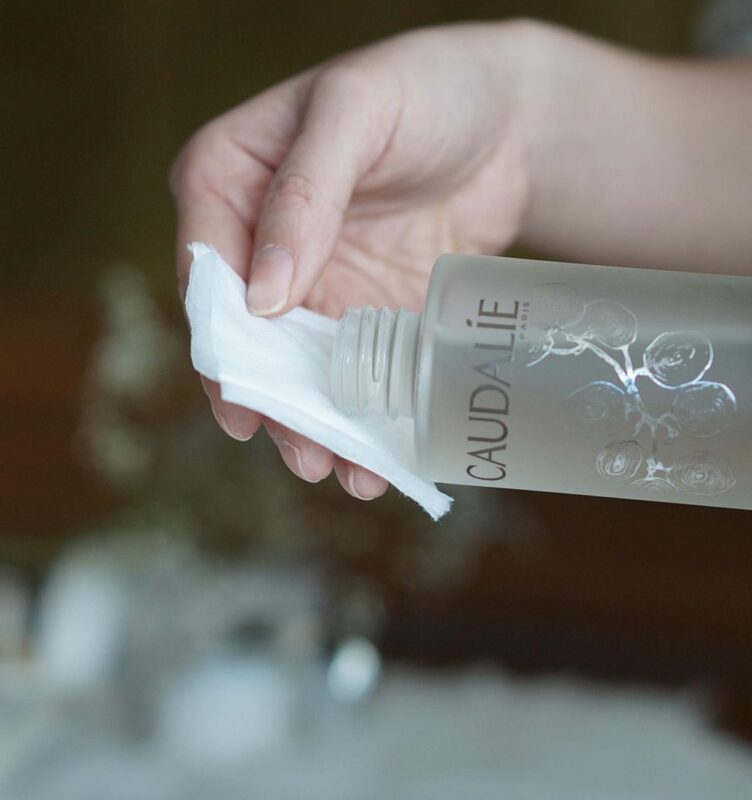 The second step in the Caudalie Vinoperfect collection is the application of the Complexion Enhancing Radiance Serum ($89). I love droppers because it feels very luxurious and more hygienic. Also, this is totally placebo, but it makes it feel more “professional”, like a spa facial. There is a light smell to this product and I like it a lot more than the essence. The silky watery formula spreads very easily on the skin and sinks in quickly. The newest product to join the Vinoperfect collection is the Brightening Glycolic Night Cream. 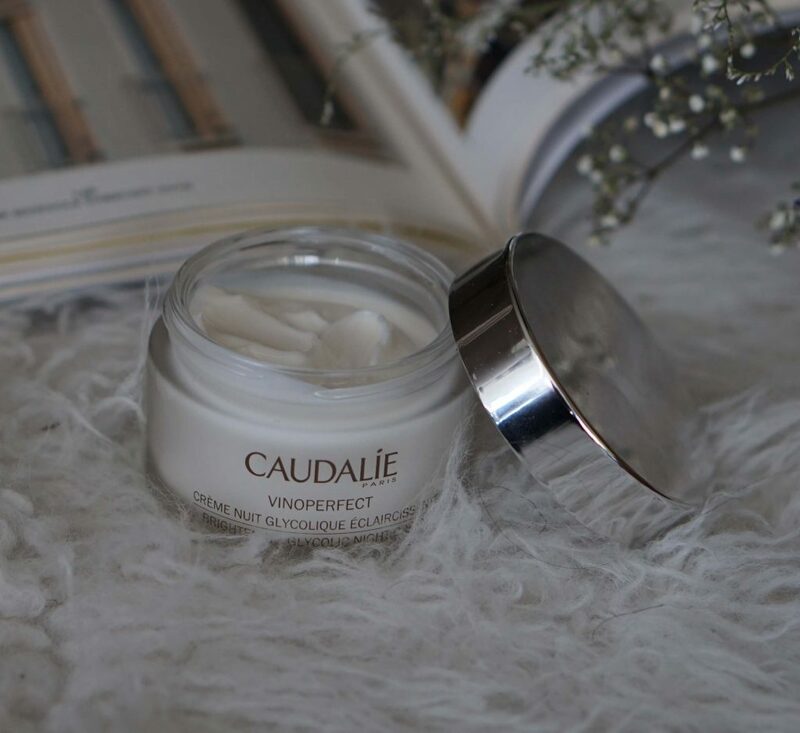 I have very dry skin especially during the winter time so the most important thing for me in a face cream is the ability to hydrate. I am extremely surprised by how plump my skin feels after using this cream. Although it’s meant to brighten and even the skin tone, the first thing I noticed is that my skin has felt very hydrated and comfortable. For those who are interested in ingredients in skincare, here’s a small breakdown of the main ingredients in this facial cream. First, there is glycolic acid. This ingredient boots cell renewal and is what will help your skin look more even. To exfoliate off the dead skin, the night cream contains papaya enzymes. In terms of hydration, this cream contains shea butter, grapeseed oil, olive squalane, hyaluronic acid and glycerin. I had one really bad acne scar on my left temple that’s been around since October! This has been reduced and looks a lot lighter. However, I have a new scar near my chin that came in around January and I did not see too much improvement in it. I think it requires even longer term use to see any skin tone improvements because it takes time for cells to turnover. What was really great about this collection though was that my dry skin felt hydrated and plump! My skin felt super comfortable and nourished which is a big plus for me. My favorite item is the night cream and I’d recommend it for anyone that likes a richer cream.